Why Time-Phase My Project Budget? Time-phased budgeting allows project managers to allocate costs for project activities over the anticipated timeline in which those expenditures are planned to take place. Not just by using any old guess as to when things might happen – or by using some uniform, evenly distributed pattern – but by actually using real contractual agreements as to when items are planned to be paid for. By doing this, the project manager is then armed with an accurate timeline that predicts project spend patterns. Time-phased budgeting does more than just uniting the project schedule with the project budget. Of course, uniting the two is the first step in a time-phased approach to project budgeting. Without first merging the two, budget and schedule have no interconnection, and are left to float along independently. By subsequently time-phasing a project budget, you’re then armed with extended capacity to further refine exactly when, during the anticipated schedule, certain expenditures will take place. This delivers a more accurate representation of cash outflow so that appropriate project financial planning can be undertaken. You’re also much better able to monitor budget vs. actual costs as the project progresses so as to gain clear insight into potential cost overruns (or, under-runs) and other cost controls capabilities. The rest of this article is dedicated to helping the reader understand the significant value that time-phased budgeting brings to helping manage both cash flow; and gaining key project cost controls. First, let’s briefly discuss how time-phasing a budget helps in managing cash flow. Let’s say for example, you have a $50m project. I’m talking cost, not revenue. This is an important distinction, since revenue flows in a much different pattern than cost. And it doesn’t always synchronize with costs in ways I’m sure you wish it would. This is the essence of the trickiness of cash flow. Money flows out at a different pace than it flows in. So, this $50m in cost will have to somehow be covered by you regardless of when the project revenues arrive in your bank account. Luckily, it’s pretty unlikely that you’ll be paying out the whole $50m in one lump payment. On the other hand, it’s also unlikely that the costs are going to be expended in a smooth and linear line that follows the start & end date of the project (or its tasks). The reality is that there can be hundreds of individual payments of different amounts occurring at different times; all based on anything from contractual agreements with vendors to the timing of payroll burden. Alison: What do you mean? Mark: Well, I might need it tomorrow or six months from now, I really don’t know for sure. I just know that I need it. Mark: I know. The thing is, if I put it aside now, it might just sit there for six months – and I can’t afford to do that cause I need it for other stuff. But if I don’t put it aside, I might not have it available when I need it. Alison: Can’t you just pay it in equal installments? Well, that’s just stupid isn’t it. Of course you should know when you need to pay! The thing about this over-simplified example, is that it doesn’t take into consideration the hundreds of micro-payments that make up a project’s costs. It’s assuming an all-or-nothing type deal; or an equal-instalments deal. Both of which never happen. With the many micro-payments scenario, however, the aggregate of these payments will very likely sum up to a wobbly cash spend curve that has many peaks and valleys of cash outflow. It’s this aggregated spend graph that is a more true and realistic representation of your anticipated spend; and becomes the invaluable resource for managing project cash flow. To create this graph, however, the project manager needs to have built time-phased budgets for every resource and/or task in a project. The great thing about software, is that it makes this sort of thing pretty easy; and it does all the calculations and other heavy lifting for you, so all you need to know is how much and when. This example illustrates the fact that payment for the work that happened in June and July will be covered partially in August. Bear in mind that this example shows a pretty simple payment structure; the whole story might be more complicated than three equal payments. They may, for example, have more or fewer payments of varying amounts that include holdbacks, deposits and progress milestones. This is just one of many hundreds of activities that make up a total budget. If you include time-phased estimates for all the labor, equipment, materials, expenses, consumables and contracted services that go into the execution of the many activities, then the aggregating of all these items can result in a powerful spend line at all levels of the project. Instructing the system of the details of these anticipated payments will provide the project manager good cash flow management, and as we’ll see, much better project cost controls. You could make the case that the term “Cost Control” is another way of saying, “Staying on Budget”. In order to know if you’re on budget, you not only need to know what your budget is – but you also need to know what your budget is at any point in time. A key facilitator of good cost controls is the ability for a project manager to view Planned vs. Actual at any time during the execution of the project. It’s not enough to know that you have a $50m project. You also need to know, after 130 days into the project, exactly how much you had planned to spend by that point. And again at 136 days, and so on. Additionally, for good controls, you need to know what you had planned to spend it on. Having that kind of detail about your plan then enables you to compare that against what you’ve actually spent so as to ensure that these things line up. Being able to calculate the EVM metric, Planned Value (PV), is dependent on there being a time-phased budget in place. Most project controls professionals will ensure their project is tracked on a daily (or near-daily) basis; and it’s this tracking that leads to real-time reporting on actual costs. When you’ve planned out your estimate using time-phased models for your resources and tasks, you’ll be able to do far more than just examine the fact that you’ve spent 30% of your budget and you’re about 30% through the schedule. Time-phasing your budget lets you go to the next level to gauge more precisely how much you’d planned to spend at this point and on what exactly. Then compare that with what you’ve actually spent. This eliminates the surprises and unknowns that can cause cost overruns for even the most seasoned project manager. 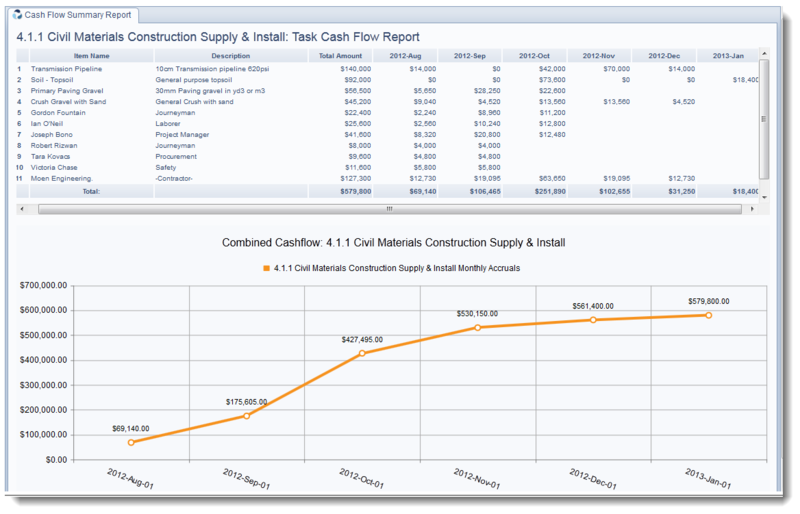 4castplus provides powerful and easy to use time-phased budgeting capability. Every resource and task can be planned out on a timeline with a quick and intuitive interface. You can use percent, quantity of units or total cost amounts to enter the values for each time-phasing increment. All the calculations are done automatically and rolled up to the various levels of the project. You can view charts and tabular reports on almost anything in a project - including planned vs. actual vs. earned value (S-Curve) - all which are available in a single click. You can also aggregate many projects together to visualize a forecast spend report for an entire program of projects or business unit. As the project progresses, you can make forecasting adjustments to the time-phased estimates so that you can re-allocate the anticipated accrual plan as a forecast. This retains the original time-phased plan while allowing you to adjust as the project carries out. 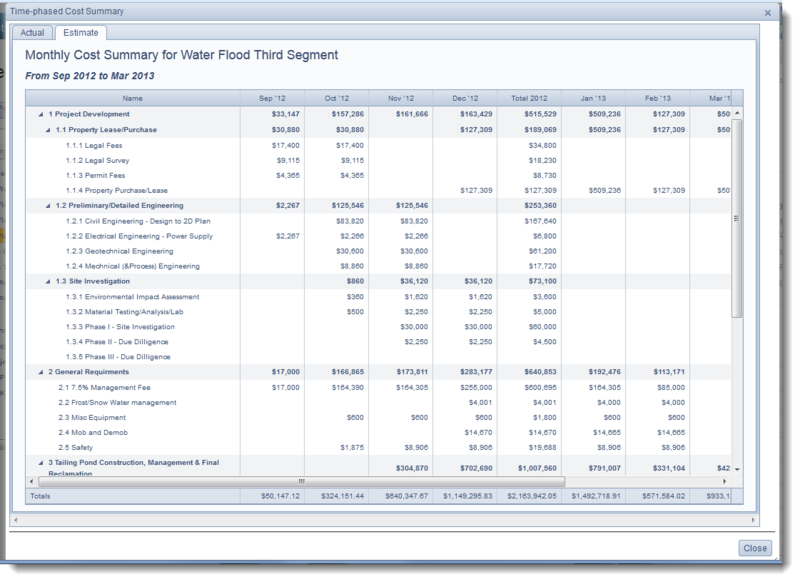 Click on the screenshot to the right to see a project's time-phased report in a tabular style including month-over-month estimated spend by WBS item. Notice there are two tabs: Estimate and Actual so that you can compare the difference.